Justin Bieber cannot stay out of the spotlight as of late, and not in a good way. The prince of pop has been apprehended by police on multiple occasions the past month on charges ranging from resisting arrest, vandalism, drag racing and driving under the influence of drugs. Public backlash has been especially vicious for the Canadian native as official petitions to deport Bieber have made it all the way to the White House. In a new video released following Bieber’s arrest for drag racing, the singer is seen bent over and being searched by guards before his admittance into a Florida jail. Beiber doesn’t put up a fight at all, which is contrary to reports of his actions at the scenes of his many crimes. Justin Bieber was reported as saying, “What the f*** did I do?” and other slanders at police while he was high on marijuana and prescription pills. He was also said to be showing erratic behavior on an airplane following the Super Bowl. Patrons on the plane said he appeared to be on drugs, again. 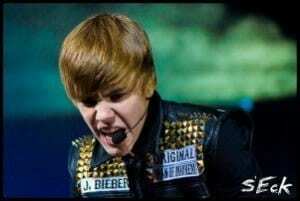 The Biebs appears to be coming apart at the seams. Who knows how long he can keep up the reckless streak before serious jail time happens. But in any case, if you don’t believe that a multi-millionaire pop singer has to go to jail like the rest of us, well here’s footage on YouTube.